Businesspeople in the Tibet autonomous region are feeling more confident about their careers thanks to the regional government's efforts to boost the green industry. The region plans to make significant progress this year in ecologically sound ventures, Qi Zhala, chairman of the regional government, said during the recent regional people's congress. Tibet remains one of the globe's best-preserved environments and is therefore an ideal place for green industries to prosper, such as bottled water and Tibetan medicine. According to Tibet's 2018 government work report, the added value of green products hit 5.3 billion yuan ($783 million) over the year, an annual increase of 14.3 percent. Tsewang Nyima, head of Manling county, said he has been encouraging people to plant Tibetan medicinal herbs. In 2010, the county government took steps to make the area a center of Tibetan medicine. Seeing a business opportunity, entrepreneur Nyima (not related to Tsewang Nyima) and his son Tsering Norbu established the Golden Sun Tibetan Herbal Plantation Farm in 2012. The farm grows six kinds of herbs and sells them in other parts of Tibet and neighboring Yunnan province. In 2017, the business earned more than 300,000 yuan. Elsewhere, the region's Nang county is focusing on apples and chili peppers. 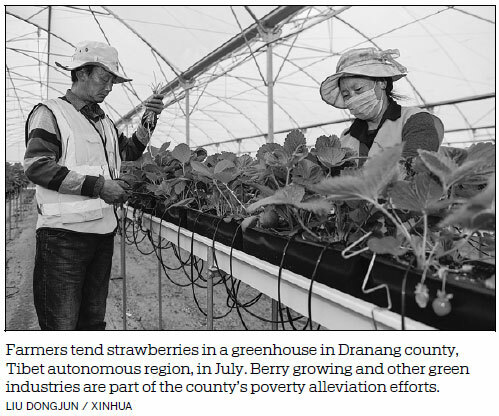 "Green industries have become an important second source of income for rural residents," said Dawa Drolma, a deputy to the congress and an agricultural technician from the region's Nang county. She added that collecting caterpillar fungus was a primary source of income for farmers there. "In the past, farmers had to find their own markets and sell products individually. But since last year, the government has helped to establish cooperatives to expand the market," she said. "Every year, we conduct three to four workshops for the farmers to help them improve their skills and business thinking." In Chushul county, near Lhasa, a grape farm owner - a Tibetan Catholic named Lucy - is delighted with the region's commitment to boost green industries. Since 2015, she has run a grape vineyard on a national agricultural pilot base. To produce genuine green products she uses sheep dung as fertilizer. "It was a bumper harvest for me. I made more than 1,500 liters of grape wine last year and earned about 20,000 yuan," she said. Her wine is gaining popularity in Lhasa, she said, adding that she also helps residents raise their incomes by renting their land and providing jobs. As one of the local government's efforts to aid the green industry, the Chushul county government invested 400,000 yuan in her grape farm. "I will always stick to green innovation, and I hope to produce more green products for the rest of my life," she said.